Poets occupied a predominant place in the Gaelic civilization. They were thoroughly trained during long years spent in the Bardic Schools which blossomed in Ireland up to the first part of the 17th century. Their place in society had long been recognised and respected. They belonged to a hereditary caste in an aristocratic society and were given an official and respected situation owing to their excellent knowledge of the history and traditions of their country. The Irish bard was not necessarily an inspired poet. He was a man of letters with a wide experience of poetry, a refined and sophisticated means of expression highly valued by an elite. Both a chronicler and a political essayist he was a critical observer of his contemporaries, thus playing a role close to our modern journalist's. In accordance with the tradition of the "Big House", he travelled throughout Ireland from house to house, was entertained by members of the gentry who, together with their family and servants formed a social unit - a sort of oasis in a desert of poverty- lavishing hospitality and charity on their guests. The poems were composed in honour of his hosts who were praised in elegies and panegyrics. They were chanted, with some kind of harp accompaniment. The bard could accompany himself; however, the functions of the poet and of the harper were distinct, the harper also having a recognised status. These tributes were kept by their addressees. Unfortunately, there is no trace of the music and it is very difficult to imagine this music, as the complex metrics of the poems has hardly any connexion with the melodies that came to us. The Cromwellian Settlement, in 1652, marks the end of the Bardic Schools. heir scholarly poetry, hermetic to anyone without any education, disappeared slowly. Although unnoticed and even despised, a popular poetry of a very different kind co-existed. In its verse-structure, each line had a fixed number of stresses, arranged to a definite pattern. From then on, it seems that harpers composed not only tunes but also the appropriate words for these tunes, following the criteria of this popular poetry. At the end of the 17th century, the tradition of the Big House was still alive and the harpers were numerous. They were welcomed as distinguished guests in these houses where they played their repertoire and gave lessons to their hosts. Very often blind they travelled the roads of Ireland on horseback with their guide, plodding along in harsh conditions, braving the bad weather and the surrounding poverty. Turlough O'Carolan fits in with this tradition. He composed most of his pieces during his journeys. As a musician, he started with the melody and then added the words in honour of his hosts; these words were written in Gaelic, the language spoken by most of the Irish in those days, including the educated classes despite all the attempts to eradicate it. It was therefore Carolan's language, the language of his poems, of his jokes and of his famous retorts. Faithful to the tradition of the previous centuries, he was impartial and composed for the old Irish aristocracy as well as for the nobles of English origin. As a highly regarded composer he was welcomed by all the well-known families who appreciated him not only for his talent as a musician but also for his cheerfulness and his faithfulness to commitments. Famous all over Ireland, he kept up his friendship with high-ranking men such as the writer Jonathan Swift, and a book of his compositions was published in Dublin in his lifetime, which was an amazing achievement for an Irish Catholic harper who never denied his faith during the worst period of the Penal Laws. In an age of gloom for Ireland, Carolan brought something new to the music of his country, a kind of mischievous joy which seemed to be lacking before, with here and there some Italian sunshine. Thanks to him, the names of fair women and gallant men, now long dead, are still alive in the charm and grace of his melodies. Born in Nobber, a little village in the county of Meath in the north of Dublin, in a Catholic family, he leaves this part of Ireland with his family at fourteen to live at the Mac Dermott Roe's of Ballyfarnon in the county of Sligo, where his parents found employment. Rapidly Mrs Mac Dermott takes the young Turlough under her protection. She takes care of his education and teaches him the harp. All his life she will remain his benefactress. Having lost his sight at the age of eighteen following an illness, he decides to become a professional harper. Three years later Mrs Mac Dermott provides him with a horse, a harp and sum of money, and thus he begins his career as an itinerant minstrel. At this time, the harp is still the instrument par excellence in Ireland. Every aristocratic family owns one or more and plays them, while waiting for a high level performance by visiting professional musicians. At the outset, O'Carolan is not a great virtuoso. His first host, George Raynolds, advises him he would be better off concentrating on composition and gives him the subject of inspiration of his first masterpiece : the mythic tale of Sheebeg and Sheemore. He writes for his patrons and their families, and the pieces he plays upon arrival are composed during his journeys. Pieces in which three influences remain: folk music, the music of the harpers and the Italian music of his time. Many anecdotes say that O'Carolan surely possessed a very good ear and a great facility to write melodies but never received the musical knowledge that would have enabled him to develop his gift to a maximum. He spends the rest of his life travelling round Ireland, being received in manors or small castles and provides for his needs by teaching the harp and playing for his hosts. He is a bon vivant, well known for his lively, caustic wit and his love of good whisky. Despite his life style he marries Mary Maguire with whom he has six daughters and a son. In 1733 Mary dies and Carolan writes to her memory one of his most beautiful poems to her memory. 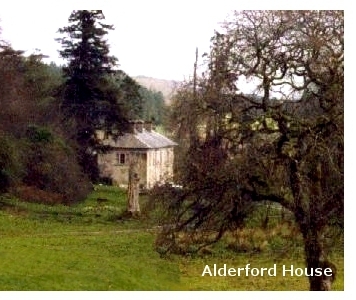 Five years later he returns to the property of Alderford in Ballyfarnon to live out his final days, cared for by Mrs Mac Dermott Roe. It is here that he composes his famous "Farewell to Music". It is told how his funeral prompted a great gathering, with harpers coming from all over the country for a wake that lasted five days and five nights. Turlough O'Carolan l eft no scores for his music. Some of his pieces were published while he was still alive and his son, also a harper, participated in a first edition of his work which, unfortunately, has only survived in a very incomplete form. It is essentially his musician friends and admirors who transmitted his some two hundred and fourteen melodies to us. O'Carolan's music is light, compared to that of the great composers of his time, yet it possesses a stong, immediately recognizable personality and remains an astonishing and original achievement. Bridging the gap between "serious" and Gaelic folk music, Turlough O'Carolan might thus claim to the title of national composer of Ireland. For the first CD dedicated to O'Carolan's compositions (Harmonia Mundi-MAN 4966) I have harmonised and arranged twenty pieces for classical guitar exclusively. For the second CD (HM-MAN 5026) I have widened the orchestration of nineteen new pieces by the Irish Bard to recorders, to the mandolin, the fiddle, the sistrum, the mandola and percussions. That is why it seemed essential to me to record in addition to O'Carolan themes, two traditional dances that cannot be ignored: the Reel, a dance from distant nordic origins, and the most Irish dance: The Jig. 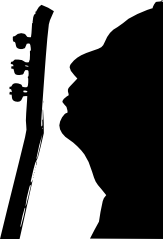 The third CD, "Solace" (HM-MAN 5077), is a tribute to the Irish musician. All the compositions recorded here are, indeed, original creations. They respect the spirit of the bard's compositions and more generally the soul of Celtic music. For the forth CD, "Irish music for today's world" (L'autre distribution MLB72CAR 2016). I have harmonised and arranged for one or two guitars 22 new pieces composed by O'Carolan. .
For the first, second and forth recordings, I have drawn from what seemed to me a most serious and well documented source: the two volumes of Donal O'Sullivan entitled "Carolan, The Life Times and Music of an Irish Harper" in which are gathered all Carolan's themes together with the historic of each piece. 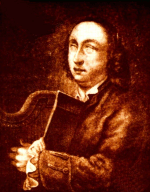 Turlough O'Carolan created his own style between the harpers' and the Italian baroque composers' tradition. He used to say how charmed he was by Antonio Vivaldi and how delighted he was by Arcangelo Corelli. We know how much he admired the violonist and composer Francesco Geminiani he met in Dublin at the end of his life. It would seem that during this meeting he composed his famous "Carolan's concerto" (MAN 4966). It explains why in many compositions we find sequences, imitations or a jig in coda in the style of the Italian masters but close to the traditional Gaelic style, Carolan's initial training to which he pays tribute with his last creation "Farewell to Music" . In accordance with the Irish traditional music, those pieces come down in the form of simple melodic lines devoided of any indication as to the harmonisation or handling of the bass and we do not have any reliable record on how the composer or his fellow harpers handled those pieces at the time. I have therefore taken the freedom to enlight one or the other side by the harmonisation and the choice of instrumentation, by choosing a sonority between traditional music and baroque music, between Ireland and Italy. For a century, a movement of writers, musicians and intellectuals have worked successfully together to give back to the Gaelic culture and language its place in Ireland. The Celtic music has now found its strength and radiance in Irish hearts but also in the entire world.